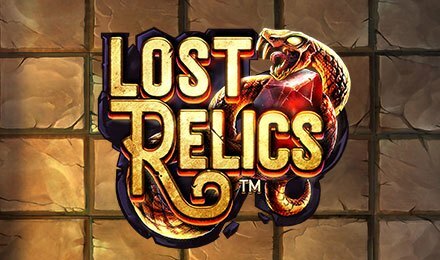 Lost Relics slot is a 5 reels and Cluster Pays game, provided by Net Entertainment. At Vegas Spins Casino, come across an abandoned island, which gives you the chance to find lost treasures and big wins! On the reels, come across symbols like Hearts, Diamonds, Clubs, Spades, Helmets, Daggers, Bracelets and Snakes Wrapped Around Rubies. Amount of Paylines Selection: Form clusters with three or more similar symbols to trigger a win! Coin Values: Coin values range from £0.01 to £2.00. The scatter symbol triggers the Free Spins Round of the game. No wild symbols come into play in the base game, however, wild symbols become active in certain bonus rounds of the game. Sticky Wilds: Wild symbols are added to the reels and locked into place for the rest of the feature. Extra Free Spins: One free spin is awarded. Coin Win: A coin win of multipliers of 3x to 30x is awarded. Coin Win: Awards a coin win of 3x to 30x to your stake. Extra Scatter Symbols: One of the symbols in a winning combination turns into scatter symbol which triggers the main bonus feature. Extra Wild Symbols: Almost 15 extra wild symbols are added in positions of symbols that haven’t formed part of a winning combination.